Like its two predecessors, OSTM/Jason-2 uses high-precision ocean altimetry to measure the distance between the satellite and the ocean surface to within a few centimeters. These very accurate observations of variations in sea surface height—also known as ocean topography—provide information about global sea level, the speed and direction of ocean currents, and heat stored in the ocean. Scientists consider the 15-plus-year climate data record that this mission will extend critical understanding how ocean circulation is linked to global climate change. OSTM/Jason-2 was launched at 07:46 UTC on June 20, 2008, from Space Launch Complex 2W at the Vandenberg Air Force Base in California, USA, by a Delta II 7320 rocket. 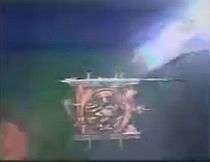 The spacecraft separated from the rocket 55 minutes later. It is now in a 1,336 km (830 mi) circular, non-sun-synchronous orbit at an inclination of 66 degrees to Earth's equator, allowing it to monitor 95 percent of Earth's ice-free ocean every 10 days. Jason-1 has been moved to the opposite side of Earth and now flies over the same region of the ocean that Jason-2 flew over five days earlier. Jason-1's ground tracks fall midway between those of Jason-2, which are about 315 kilometers (196 mi) apart at the equator. This interleaved tandem mission provides twice the number of measurements of the ocean's surface, bringing smaller features such as ocean eddies into view. The tandem mission also helps pave the way for a future ocean altimeter mission that would collect much more detailed data with its single instrument than the two Jason satellites now do together. With OSTM/Jason-2, ocean altimetry makes the transition from research into operational mode. Responsibility for collecting these measurements moves from the space agencies to the world’s weather and climate forecasting agencies, which use them for short-range, seasonal, and long-range weather and climate forecasting. Spaceborne radar altimeters have proven to be superb tools for mapping ocean-surface topography, the hills and valleys of the sea surface. These instruments send a microwave pulse to the ocean’s surface and time how long it takes to return. A microwave radiometer corrects any delay that may be caused by water vapor in the atmosphere. Other corrections are also required to account for the influence of electrons in the ionosphere and the dry air mass of the atmosphere. Combining these data with the precise location of the spacecraft makes it possible to determine sea-surface height to within a few centimetres (about one inch). The strength and shape of the returning signal also provides information on wind speed and the height of ocean waves. These data are used in ocean models to calculate the speed and direction of ocean currents and the amount and location of heat stored in the ocean, which, in turn, reveals global climate variations. Another payload aboard Jason-2 is the T2L2 (Time Transfer by Laser Link) instrument. T2L2 is used to synchronize atomic clocks at ground stations, and to calibrate the on-board clock of the Jason-2 DORIS instrument. On 6 November 2008 CNES reported the T2L2 instrument was working well. Jason 2 just before launch. CNES provided the spacecraft, NASA and CNES jointly provided the payload instruments and NASA's Launch Services Program at the Kennedy Space Center was responsible for the launch management and countdown operations. 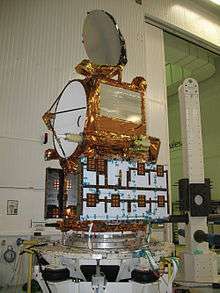 After completing the on-orbit commissioning of the spacecraft, CNES handed over operation and control of the spacecraft to NOAA in October 2008. CNES will process, distribute and archive the research-quality data products that will become available in 2009. EUMETSAT will process and distribute operational data received by its ground station to users in Europe and will archive the data. NOAA will process and distribute operational data received by its ground stations to non-European users and archive that data along with the CNES data products. NOAA and EUMETSAT will generate the near-real-time products and distribute them to users. NASA will evaluate the performance of its instruments: the advanced microwave radiometer, the Global Positioning System payload, and the laser retroreflector assembly. In addition, NASA and CNES will validate scientific data products. NASA's Jet Propulsion Laboratory in Pasadena, California, manages the mission for NASA's Science Mission Directorate in Washington. 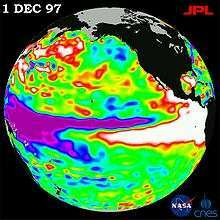 OSTM/Jason-2's predecessor TOPEX/Poseidon caught the largest El Niño in a century seen in this image from Dec. 1, 1997. The two previous altimetry missions TOPEX/Poseidon and Jason-1 have led to major advances in the science of physical oceanography and in climate studies. Their 15-year data record of ocean surface topography has provided the first opportunity to observe and understand the global change of ocean circulation and sea level. The results have improved the understanding of the role of the ocean in climate change and improved weather and climate predictions. Data from these missions are used to improve ocean models, forecast hurricane intensity, and identify and track large ocean/atmosphere phenomena such as El Niño and La Niña. The data are also used every day in applications as diverse as routing ships, improving the safety and efficiency of offshore industry operations, managing fisheries and tracking marine mammals. The missions revealed the surprising variability of the ocean, how much it changes from season to season, year to year, decade to decade and on even longer time scales. They ended the traditional notion of a quasi-steady, large-scale pattern of global ocean circulation by proving that the ocean is changing rapidly on all scales, from huge features such as El Nino and La Nina, which can cover the entire equatorial Pacific, to tiny eddies swirling off the large Gulf Stream in the Atlantic. Measurements by TOPEX/Poseidon and Jason-1 show that mean sea level has been rising by about three millimeters (.12 inches) a year since 1993. This is about twice the estimates from tide gauges for the previous century, indicating a possible recent acceleration in the rate of sea level rise. The data record from these altimetry missions has given scientists important insights into how global sea level is affected by natural climate variability, as well as by human activities. TOPEX/Poseidon and Jason-1 made clear the importance of planetary-scale waves, such as Rossby and Kelvin waves. No one had realized how widespread these waves are. Thousands of kilometers wide, these waves are driven by wind under the influence of Earth’s rotation and are important mechanisms for transmitting climate signals across the large ocean basins. At high latitudes, they travel twice as fast as scientists believed previously, showing the ocean responds much more quickly to climate changes than was known before these missions. The precise measurements of TOPEX/Poseidon’s and Jason-1 have brought knowledge of ocean tides to an unprecedented level. The change of water level due to tidal motion in the deep ocean is known everywhere on the globe to within 2.5 centimeters (one inch). This new knowledge has revised notions about how tides dissipate. Instead of losing all their energy over shallow seas near the coasts, as previously believed, about one third of tidal energy is actually lost to the deep ocean. There, the energy is consumed by mixing water of different properties, a fundamental mechanism in the physics governing the general circulation of the ocean. TOPEX/Poseidon and Jason-1 observations provided the first global data for improving the performance of the numerical ocean models that are a key component of climate prediction models. The mission's first validated data products in support of improved weather, climate and ocean forecasts are now being distributed to the public within a few hours of observation. Beginning in 2009, other data products for climate research will be available a few days to a few weeks after observations are taken by the satellite. Climate research: Altimetry data are incorporated into computer models to understand and predict changes in the distribution of heat in ocean, a key element of climate. El Niño and La Niña forecasting: Understanding the pattern and effects of climate cycles such as El Niño helps predict and mitigate the disastrous effects of floods and drought. Altimetry reveals the ocean heat that can fuel hurricanes. Tropical cyclone forecasting: Altimeter data and satellite ocean wind data are incorporated into atmospheric models for hurricane season forecasting and individual storm severity. Ship routing: Maps of currents, eddies, and vector winds are used in commercial shipping and recreational yachting to optimize routes. Offshore industries: Cable-laying vessels and offshore oil operations require accurate knowledge of ocean circulation patterns, to minimize impacts from strong currents. Marine mammal research: Sperm whales, fur seals, and other marine mammals can be tracked, and therefore studied, around ocean eddies where nutrients and plankton are abundant. Fisheries management: Satellite data identify ocean eddies which bring an increase in organisms that comprise the marine food web, attracting fish and fishermen. Coral reef research: Remotely sensed data are used to monitor and assess coral reef ecosystems, which are sensitive to changes in ocean temperature. Marine debris tracking: Altimetry can help locate hazardous materials such as floating and partially submerged fishing nets, timber, and ship debris. Jason-3 launched from Vandenberg Air Force Base on board a SpaceX Falcon 9 v1.1 launch vehicle. As of June 18, 2015 the satellite has been shipped to Vandenberg Air Force Base. After a June 2015 Falcon 9 launch failure, the mission was delayed and was launched January 17, 2016. The first stage failed to land safely on the pad due to choppy seas and a broken landing leg. at 10:42:18 AM PST. ↑ "NASA Launches Ocean Satellite to Keep a Weather, Climate Eye Open". NASA. ↑ "Jason-2 successfully launched". EUMETSAT. ↑ "Tandem Mission Brings Ocean Currents into Sharper Focus". NASA/JPL. ↑ "NOAA takes over Jason-2 satellite operations". EUMETSAT. ↑ "T2L2 ready to put Einstein's theory to the test". CNES. 6 November 2008. ↑ "(OSTM) - Jason 2 Overview". NOAA. 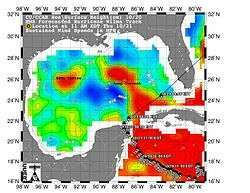 ↑ "New Oceanography Mission Data Now Available". NASA/JPL. ↑ "OSTM/JASON-2 SCIENCE AND OPERATIONAL REQUIREMENTS". EUMETSAT. ↑ "The Legacy of Topex/Poseidon and Jason 1, page 30. Ocean Surface Topography Mission/Jason 2 Launch Press Kit, June 2008" (PDF). NASA/JPL. ↑ "Jason-3 Missions Summary" Jet Propulsion Laboratory. Retrieved 25 May 2014. ↑ "Launch Manifest" SpaceX. Retrieved 25 May 2014. 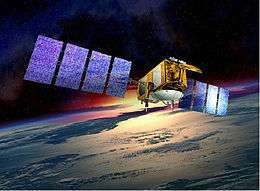 ↑ "Jason-3 Quick Facts" National Environmental Satellite Data and Information Service. Retrieved 11 June 2015. ↑ Clark, Stephen (2015-06-18). "Jason 3 satellite shipped to Vandenberg for SpaceX launch | Spaceflight Now". Spaceflight Now. Spaceflight Now Inc. Retrieved 2015-06-22. ↑ NOAASatellites (11 December 2015). "Launch date for Jason-3 announced! Launch scheduled for Jan 17, 2016 at 10:42:18am PST." (Tweet) – via Twitter. ↑ "Jason-3 January 17, 2016 Launch Date Announced". NOAA Satellite and Information Service. 8 January 2016. Retrieved 15 January 2016.